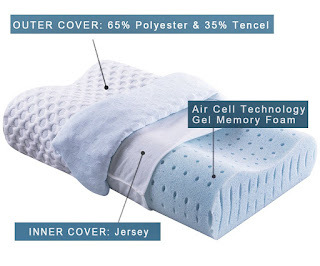 Cr Sleep Ventilated Memory Foam Contour Pillow with AirCell Technology. The contour pillow is ergonomically 2-in-1 wave designed to give you a choice between a higher contour and a lower contour for support that's just right for you. The contoured design adapts to the weight of your head and neck conforms to your curves aligning them with the top of your spine for a restful and uninterrupted sleep, which may also help provide relief for sufferers of snoring, insomnia and stress. This pillow is made of premium ventilated Air Cell technology gel memory foam, promoting airflow to keep the head and neck cool during sleep. With perfect height and medium firm feel, our pillow is designed to provide maximum comfort and support for people of all sleep positions. This pillow does not contain any toxic ingredients like formaldehyde, methane chloride, or PBDE and provides a protective barrier against allergens such as mold, dust mites, and other bacteria. My Opinion: I am always on the lookout for a great pillow as it is hard to find one that will support your head and neck which is where I am always so very sore, I am also suffering from fibromyalgia so that does not help much with all my aches and pains. I have been using this pillow for one week now and I really like how it supports my head and how soft it is.